It must have been in about 1967 or 1968 that at a Parish Council meeting the idea of having a museum in Mere was floated. The meeting was discussing the possibility of having a new County Library in the vacant school building in Church Street. Until then, Mere’s Library had been in a small room in Salisbury Street in what is now the office of Elite Financial Planning, opposite The Lecture Hall. This room was quite inadequate for the needs of a town the size of Mere but, surprisingly, there was some opposition to a move to Church Street. However, good sense prevailed and it was agreed that a new County Library would take over the old National School if possible. I asked that, if a new Library was provided, space might be given to having a few showcases there to display items of local historical interest and subsequently the County offered to do this. Two large and two small cases were made available and the new Library opened in May, 1970. There was at that time a Local History Committee which had produced the book “The Story of Mere” in 1958 and this committee, of which I was a member, was made responsible for arranging displays in the new Library. An appeal was launched asking people to lend or give items of local historical interest and from this small beginning, a collection was gradually built up. In 1972 the Local History Committee, at the suggestion of its Secretary, Christine Wallis, proposed a widening of its scope by founding a Mere Historical Society. At its inaugural meeting in Mere Library on 20th. April, 1972, a constitution was proposed and adopted and 80 people enrolled at an annual subscription of 50p. The Historical Society then took over responsibility for what became Mere Museum and remained so until 1978. In that year the Museum became independent under a new Mere Museum Committee of which I was made Chairman. The Secretary was Jo Barnes the Librarian and the Curator was Col. Cyril Scott. Representatives from the Duchy Manor School, the Parish Council and the County Council were invited to join the committee. The County Museums Service had a seat on the committee and they offered “pastoral care”, that is, they offered advice and support and they undertook to find 45% of the cost of any approved project. That left the Museum with the problem of finding 55% of the cost of any major expense and it was done by having Coffee Mornings and so on. In 1989 or 1990 Colin Anderson put forward the idea of having a Friends of Mere Museum organisation to take over the burden of fund raising and to be a support group in other ways. This proved to be a very successful idea and The Friends have continued to flourish. In 1982 Cyril Scott resigned as Curator and was succeeded by Derek Behrens. Derek left Mere in 1984 so a successor was needed and, no longer Chairman of the Museum Committee, I offered to take on the job. I remained as Curator for the next 23 years! In 2001, Jenny Wilding was appointed Assistant Curator and when I retired in 2007, she was elected, much to my delight, as my successor. From early on, the difficulty of having sufficient storage space has been present. At first, the Museum had open shelves in the Library’s kitchen, which was not convenient for either the Library staff or the Curator. 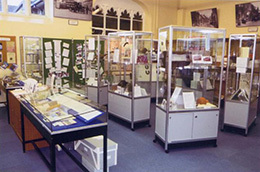 When a Telecottage facility was proposed for Mere in 1991, that back room in the Library was designated to house it, so the Museum’s storage shelves had to be moved. A dark and rather narrow passage at the back of the Library was offered as a Museum store; this was far from ideal but the Curator had to make the best of it and it remains as the Museum’s main storage area. Later, space behind bookshelves at the far end of the Library was made available to the Museum and now, with new display cases that have cupboards underneath them, the storage problem has become less acute.